The idiosyncratic, eclectic vision of the Gramercy Park Hotel attracts both business and leisure travelers who desire a unique and exclusive hotel. The hotel's 185 rooms offer a perfect modern alternative to the institutional approach found in most high-end lifestyle hotels. Extraordinary features, dining and location define this exceptional hotel. Guests receive access to the exclusive Gramercy Park, enjoy Julian Schnabel designed furniture and museum quality artwork throughout as well as a wide array of top-notch amenities. The Maialino Restaurant and Gramercy Park Roof Terrace by award-winning restaurateur Danny Meyer, the Rose Bar and the Jade Bar offer the highest quality food and drink. 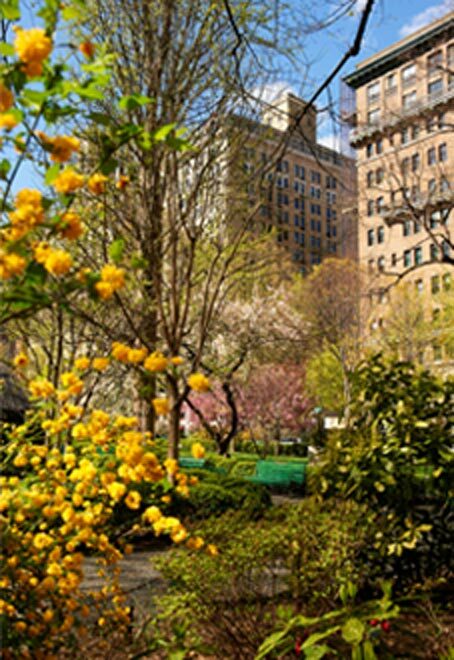 The Gramercy Park Hotel is located across from Gramercy Park, the only private park in New York City, in the heart of Manhattan’s exclusive Gramercy Park neighborhood. The hotel is within walking distance to Union Square, the Chelsea art galleries, the Meat Packing district, SoHo, NoHo, Nolita and the East and West Villages. With close proximity to the subway, it is a convenient to commute to the Jacob Javits Convention Center and Times Square.